For years, hospitals had an “if you build it, they will come,” strategy that allowed them to avoid focusing on data capture and analysis. In those days, the concept of brand strategy was almost ignored; in fact, many hospitals didn’t even have a department devoted to marketing. Then came HITECH and the emphasis on EMRs, along with the rise of cloud computing as a digital disrupter. When declining reimbursement and increased regulatory scrutiny came surfing into the mix, you had a perfect hurricane of factors driving hospitals to not only capture data but also try to do something actionable with it. CMIOs, CIOs, and IT managers began focusing on the data center, driven by newly established marketing departments striving to capture the best payer mix. Today, hospital budgets are shrinking and technology leaders are looking to the cloud for data storage as a viable option to provide cheaper and more scalable infrastructures. As we move into the third quarter, 2017, enterprise organizations of all sizes and from all industries are moving to the cloud. Even the most conservative and regulation-driven industry on the planet – healthcare – is on board. IDC tells us that by the end of this year, 80% of U.S. hospitals will have developed a hybrid of on-premise and cloud computing data storage. With often publicized cyber threats making the news, many of these hospitals will hire managed cloud providers to help them further mitigate the risk. If your hospital is seeking to move all or part of your infrastructure to cloud computing, it is imperative that you consider a cohesive data center model to drive the migration while sustaining business as usual. When migrating any data to the cloud, hospital tech teams need to see both the forest and the trees. Getting too focused on the daily priorities without a cohesive strategy will almost certainly guarantee frustration with the new cloud computing models. What is the migration process? Most enterprise level organizations, with a great deal of on-premise technology investments, choose a gradual cutover of services. IT teams should consider the age of on-site servers and their depreciation when determining the mix of on-premise versus cloud computing that you will ultimately adopt, and the process for what and when to migrate. Cut over processes should also be validated at the department level to ensure data is moved at the best time. Decide how to manage data center assets. Obviously, the on-premise portion of a hybrid cloud computing model will have additional security concerns and greater risk of failure. Assessing the costs of outages and developing a business continuity plan, are all imperatives for hybrid models. If your on-premise servers go down, do you have a plan for data migration to the cloud? Develop a governance process for shadow IT. The flexibility of accessing cloud computing models virtually (pun intended) guarantees that you will see changes in the types of devices that access data. It may also facilitate the increase of other inter-departmental projects that seek to access the cloud. Decide if you’re going to seek support from managed cloud providers. Migrating applications and databases is much more complicated than moving files, of course, so consider an MSP as a resource for a public, private or hybrid cloud computing model. Download our cloud report to see what other strategies enterprise organizations are adopting in cloud computing models. and mitigation plan for when things go wrong. 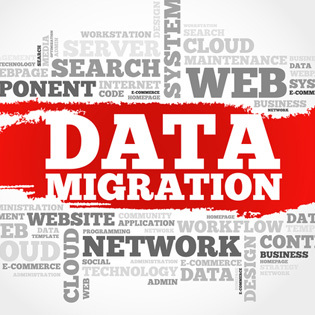 MSPs can help you mitigate the risk of data migration by assisting all phases of your cloud computing process. Get a free assessment to find out how a managed cloud provider can help your hospital adopt data-centric cloud migration policies.